At CORE Butte Charter School, we value personalizing the learning approach for each of our students. This math curriculum page is designed to provide an introduction to a variety of math curricula for you to explore and help guide your decisions as to which curriculum to use. Engaging a student with the everyday use and application of math, while enhancing a students experience with studying math, is our goal. Review the recommended five curricula in light of the student's learning style and the curriculum's approachability for the parent teacher. Discuss your selection with your Personalized Learning Teacher and prepare for an exciting time in Math! Placement tests for each curricula are accessible from the links below. Please see your Personalized Learning Teacher for placement test keys. Please click the curriculum name for each of the vertical columns below to view information about the recommended math programs. Excel Math SPIRALING – is a sophisticated process of introduction, reinforcement and assessment. It leads to mastery and long-term competency for each student. Excel continually bring in new topics, while refreshing math concepts they've learned before. Students aren't tested on a subject until they've had multiple chances to succeed in Guided Practice and Homework. Excel Math CHECKANSWER – this unique self-assessment enables students to confirm their work. The CheckAnswer process helps students develop confidence and good work strategies. Students solve a set of 3-5 problems (A-C), add the answers and see if the sum matches the CheckAnswer (D). If it does, they move on. If not, they go back and re-check their calculation. CREATE A PROBLEM: This feature enables students to express their own understanding of a story problem. It merges math and literacy. The program starts with simple stories and gives students a chance to observe what is happening in the story. They then use those observations to solve problems. Later in the curriculum students are asked to create a problem or two, and make up a CheckAnswer. Finally, students are able to finish a story in their own words, and write several problems about their story ending. This demonstrates mastery AND integration. 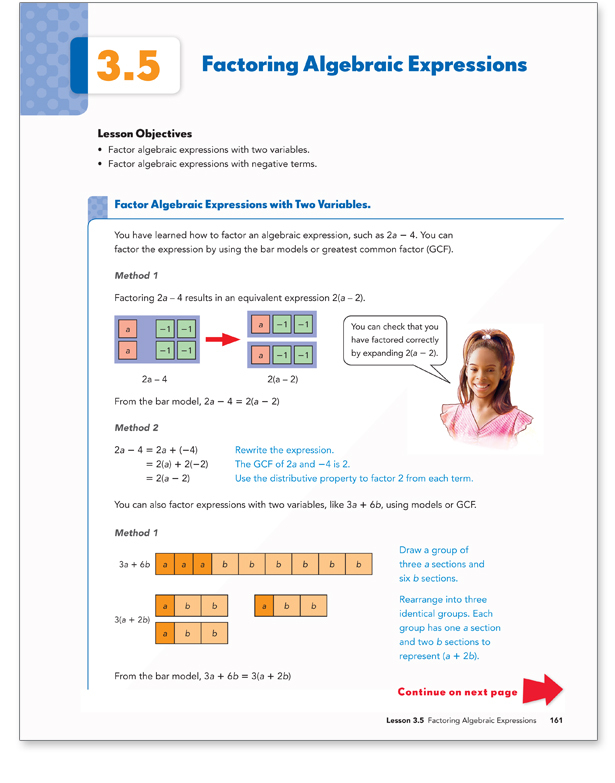 The format of the page allows longer answers, along with charts, graphs and other expressions of their solutions. Write-in Student text are printed on legal-size paper. Common Core aligned Teacher Edition (simple 1 page lesson plan and answer keys). Limited online resources. Spanish version available. Concrete illustrations are incorporated heavily in the early grades, gradually giving way to more abstract representations so that math is learned meaningfully. Emphasis on the use of model drawings as a tool to problem solving. Develops a foundation consistent with application in higher level math (algebra, geometry, etc.). Math in Focus 6-8 is the recommended middle school curriculum in line with Primary Mathematics' Singapore model. Glencoe Math is a seamless transition from My Math (primary grades) into a middle school curriculum. Both are the same curriculum with different names. It is a unit/chapter approach that spirals back to reinforce skills learned in previous chapters. It uses an easy to follow "I do/We do/You do" pattern. Content is presented in the same order for each grade providing a cohesiveness that connects learning to previous years. It's online resource allows students to access content using different approaches. Icons in the student text indicate the online resources so the student knows when they can access additional resources such as tutor videos, songs, games, vocabulary activities, interactive videos, and video introductions to chapters. Building technology skills and math vocabulary are other key elements of My Math and Glencoe Math. The student text is a soft cover, write-in book, allowing students to engage directly with the text. The presentation is colorful and easy to follow. Plenty of space is given for students to show their work. Unlimited access to the student online edition, and shared access to the online teacher edition. Online: Self-check quizzes to build confidence, visual and auditory interaction with content, tutor videos, games, and much more to explore. Plain textbook designed for the students to read and follow one lesson per day. Each lesson teaches a little and then the rest of the lesson is setup for practice of already covered skills. Concepts are taught in small, approachable increments. Increments are spread throughout the year, building in complexity, so that by the end of the year students have reached deep understanding and fluency. Practice and assessments include concepts from the most recent lessons as well as from earlier in the year, ensuring students retain all concepts and can make connections between them. Instructional Presentations: Online or CD. Ready-to-use presentations support each lesson. 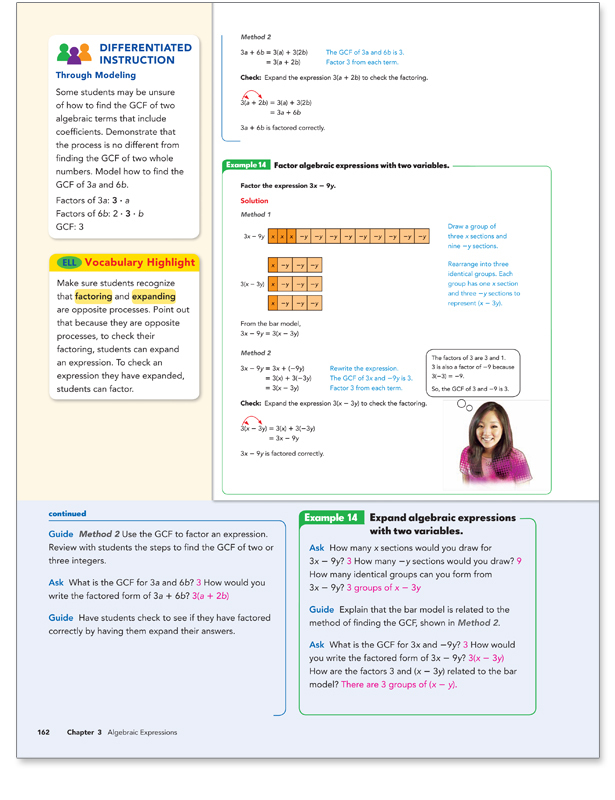 Contains examples from each lesson and answers from practice problems. CONCRETE MODELS: Beginning with what a child/person knows and can experience through touching and manipulating. PICTORIAL or VISUAL MODELS: Pictures to represent concrete. This is a step that in the past has often been left out of traditional American curriculum and methodologies of teaching mathematics. ABSTRACT: Using written numbers, symbols and algorithms to represent the concrete and visual. Text follows an "I Do, We Do, You Do" format with direct instruction with hands-on, guided practice, and independent practice. Colorful with plenty of white space. Teacher editions and student texts are split into two semesters. TEACHER EDITION: Includes a wrap-around version of the Student text and activity guide to help with the concrete experience. Math in Focus K-5th - Designed using Singapore's model for mathematics. Dimensions Math 7th-8th - Integrated curriculum offering advanced level math concepts. TPS Creative Core Math K-8th - Inquiry based materials written by teachers and accessible for all students providing innovative coverage of the Core Curriculum standards for California.